Once a year, on a summer’s evening, the Writers Guild of America Theater fills with dozens of teen girls. Armed with their well-worn journals, pens at the ready, and with supportive older mentors at their sides, their excited voices echo throughout the theater’s walls as they anxiously prepare for their first public readings. It’s the final showcase for WriteGirl, and as an alum of the high school writing program, it’s an evening I won’t soon forget. I remember looking over my poem one last time with my mentor. I couldn’t wait to get on stage to wow my family, and this feeling alone was a huge milestone for me. A year earlier the thought of public speaking would have consumed me, and most of my fellow aspiring writers, with absolute dread. But after a year of monthly writing workshops that embrace each participant in a warm glow of encouragement, support and sisterhood, you can’t help but carry a sense of newfound confidence right out onto that stage. 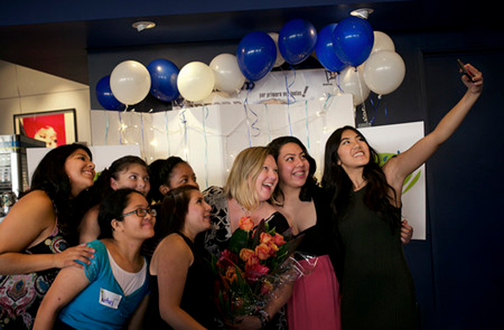 It’s that drive and commitment from Taylor that has helped power WriteGirl’s success. Its first event in 2001 had a turnout of 30 teen girls and 30 professional women writers. Today, the organization serves more than 500 girls annually and maintains a 100 percent college acceptance rate for their graduating seniors. About 150 accomplished women journalists, screenwriters, novelists, poets, academics, songwriters and playwrights volunteer each year to mentor the teen girls throughout their journey in the program. A poet and artist, Taylor started WriteGirl as a way to foster self-esteem among young women. I can attest to the power of the program, as WriteGirl helps young women feel that anything is possible. For me, that meant graduating with an A average and being the first in my family to pursue a college education. It’s no surprise that the program has attracted significant media attention and some impressive accolades, including the National Arts & Humanities Youth Program Award from First Lady Michelle Obama in 2013. In 2014, Keren Taylor was named a CNN Hero. Last year WriteGirl joined forces with Arts for Incarcerated Youth Network, a fellow project of Community Partners, to form the Bold Ink Writers Program for incarcerated teen boys and girls. They are also expanding to serve teen boys. Ultimately, Taylor aims to expand WriteGirl’s reach and develop a training program to bring their materials to other groups. For me, I think every teen girl could benefit from what WriteGirl offers, and I could not be more grateful to the volunteers and staff who helped me find my voice and pursue my dreams. “Never underestimate the power of a girl and her pen,” is the organization’s motto. What you learn is to never ever underestimate yourself.